In Monday's option recap I covered the relatively simple positions that either closed or opened during the previous week. However, I also went with some more complex, not too complex, option strategies to be able to boost up my option income. A covered strangle might sound complex, but it really isn't. It's just the combination of owning 100 shares of a company and then using 2 conservative option strategies, a covered call and a cash secured put, to generate option income. The biggest risk with a covered strangle is that you could potentially be on the hook to purchase 100 more shares of that company. I originally purchased 100 shares of CVS in my Rollover IRA back in January via a buy-write for a net purchase price of $83.20. Just bear with me because there's a bit more to cover than just a standard put or call option. There's 3 different ways that a covered strangle can work out. The share price can end up below the strike price of the short put, it can end up above the strike price of the short/covered call or it can end up between the two strikes. Ideally the share price would stay between the two strikes and I would just be able to keep the option premium and call it a day. 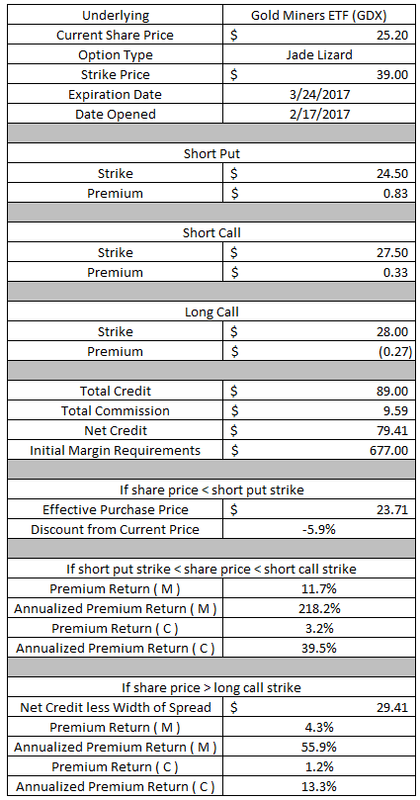 In this case the strike price of the put option is $77.50 and the strike price of the call is $83.50. If the share price does in fact stay between those two I would keep the $107.90 of option premium as profit. That would represent a 1.39% return based on the $7,750 of capital to protect the put option which is a 23.4% annualized return. If the share price falls below the short puts' strike price then I'll have to purchase an additional 100 shares of CVS for $77.50 less the total premium received. That puts my effective purchase price of the new lot of shares at $76.42 which is around a 2.9% discount from the price when the position was opened. I would then own 200 shares of CVS at an average cost basis of $79.81. If the share price rises above the covered calls' strike price then I'll have to sell my 100 shares for $83.50 plus the net credit received. That gives an effective sale price of $84.58 which would net me a 1.66% increase from my cost basis. Overall I like the covered strangle as a way to take in more option premium or lower my average cost basis for existing shares. Obviously the big risk is that you could be forced to double your position size, but knowing that ahead of time makes it essentially a non-factor. I'm currently trying to get covered strangle positions on for both V.F. Corporation (VFC) and United Parcel Service (UPS) in my Rollover IRA. I've been sitting on about $14k within my FI Portfolio for quite a while now. It didn't start out that way rather it was the slow accumulation from dividends and a couple position trims that I made. But here I sit with nearly $14.8k of capital and a decision had to be made. The problem is that I don't see a whole lot of value. Most of the companies that I want to invest in are still flirting with the high end of fair value. While that's not necessarily a bad thing it's also not ideal. Just sitting completely in cash doesn't really appeal to me because it could be put to better use by either investing it or going the options route. As of now I've decided to stay in cash and use it to generate option income. Of course the problem is that I could "miss out" on those opportunities should the markets really tank. So I decided to branch out a bit by using options on 2 different ETFs that, in theory, should move the opposite of the markets if the markets do tank preserving that capital to make those strategic long-term investments. I've caught a case of gold fever. Not really, but I've settled on the two miner ETFs, GDX and GDXJ, as positions to try and trade around. The implied volatility in these two ETFs is quite high and as such they offer a better return for the same amount of capital compared to the companies that I typically write puts against. Since this is a bit out of my norm I wanted to make sure I did these trades in my taxable account so I can write off any losses if things don't turn out as planned. Plus doing this in my margin account requires less capital to secure the positions, although I'm still going to keep things conservative for now and will report the return based on both the cash secured and margin capital requirements. In order to come out ahead of scenario one's ~$440 in annual dividends I need to earn approximately $50 per month via options/capital gains since they will be taxed at a higher rate. Let's get into the trades. Junior gold miners are notoriously volatile and can see market fortunes made and lost depending on what the price of gold does. That leads to high implied volatility which in turn means high option prices. When I opened the contract on February 17th the share price of GDXJ was trading at $42.12. I sold to open the $39 strike put option expiring March 17th for $0.92. After commissions/fees I collected $84 of option premium. 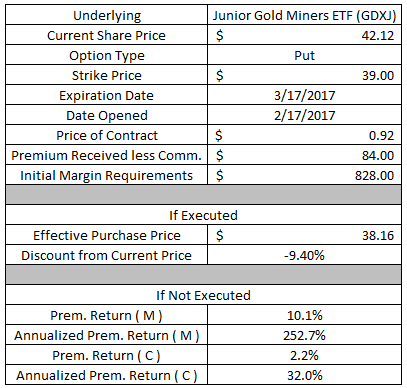 If GDXJ's share price falls below the puts' strike price I'll have to purchase shares for $39 less the option premium. That would put my effective purchase price at $38.16 which is 9.4% lower than the share price at the time I opened the position. If GDXJ's share price remains above the $39 strike price I'll get to keep the full option premium. Based on the $828 of initial margin requirements that's a 10.1% or 252.7% on an annualized basis. On a cash secured basis the return would still be solid at 2.2% or 32.0% annualized. A what? No, I haven't started buying exotic reptiles rather it's just another option type. A jade lizard can be thought of as a protected short strangle. A regular short strangle theoretically has unlimited risk to the upside since you're selling a naked call; however, the jade lizard limits the upside risk by having a long call position on top of the strangle. To set up a jade lizard you sell 1 OTM put option, sell 1 OTM call option and buy 1 OTM call option with a strike price higher than the one you sold. Ideally you would see the share price stay within the range of the two short strikes. If that happens all 3 contracts would expire OTM and you would keep the full option premium as profit. The jade lizard allows you to collect a bit more premium than just selling a naked put option and if set up correctly you theoretically have no risk to the upside since the total premium collected is larger than the width of the call spread. When I opened the position on February 17th the share price of GDX was trading at $25.20. I sold to open the $24.50 put option, the $27.50 call option and bought to open the $28.00 call option creating a jade lizard. After commission/fees I collected a total of $79.41. Similar to the covered strangle from above there's lots of ways the jade lizard can play out. If the price of GDX falls below the strike of the short put I'll have to purchase 100 shares for the strike price less the net premium received of $79.41. That puts the effective purchase price at $23.71 which is about 5.9% lower than the share price at the time the contract was opened. If the price of GDX stays between the strike price of the short put, $24.50, and the short call, $27.50, then all 3 contracts would expire out of the money. I would get to keep the full option premium of $79.41 as profit. Based on the $677 of initial margin requirement that would be a 11.7% return or 281.2% annualized. 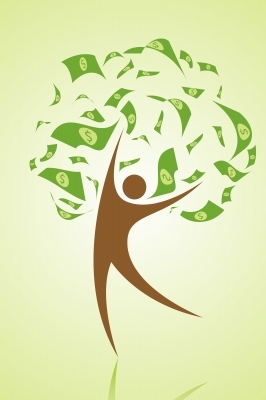 On the cash secured capital the return would drop to 3.2% or 39.5% annualized. If the price of GDX rises above the short call strike, $28.50, then the call spread would lose its maximum value. At expiration that call spread would theoretically be worth $0.50, or $50, so the net credit would be $29.41 ($79.41 - $50). Based on the $677 of initial margin requirement that would still represent a 4.3% return or 55.9% annualized. Looking at the full cash secured capital of $2,450 the return would be 1.2% or 13.3% annualized. There's still one more spot where the share price can end up and that's between the strike price of the short ($27.50) and long ($28.00) call options. If GDX's price ends up between those two then the net premium is currently unknown. At expiration the cost to close that spread would be the price of my short call option. So for example if the share price is $27.75 the price of the short call would be $0.25 ($27.75 - $27.50) and it would cost me $25.00 to close the short call. That would reduce my profit from the initial credit received $79.41 by $25.00 bringing the net profit to $54.41. Thus far in February I've been able to generate $1,078.37 in profit via closed/expired options. Year to date I've collected $2,707.76 in option premium profit. I currently have 10 open put contracts in my Rollover IRA with total capital requirements of $58,550. I'd like to get a few more contracts put on this week since I have over $53,000 of cash available to trade. The two gold miner trades stray quite a bit away from my norm which is to sell puts on companies I want to own long-term. 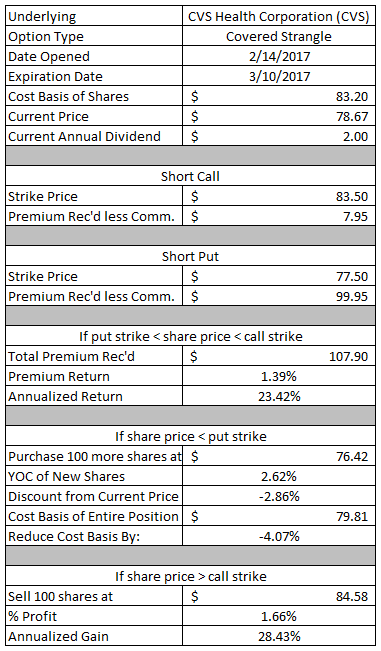 Combined these two option moves have the potential to give over $163 of option premium compared to the approximately $40 per month of dividends that capital would produce if it was invested at a 3% yield especially since the maximum capital in play is only $6,350. I figure it's worth a shot to see how it goes in case this turns into a pretty good source of additional income. Would you just invest that capital and be done with it? Or would you use options to try and generate a higher return than the equivalent dividends it would produce? I love both options and lizards so this one made me smile wide. Best of luck on the position. Figured you would get a kick out of that one.